DRUDGE: BOOK TO REVEAL OBAMA'S TRUE IDENTITY? BOOK TO REVEAL OBAMA'S 'TRUE' IDENTITY? This year's high stakes publishing project quietly went to press this week, the DRUDGE REPORT has learned. "WHERE'S THE BIRTH CERTIFICATE? The Case that Barack Obama is not Eligible to be President." The street date is a LONG month away, and author Jerome Corsi, the man who torpedoed John Kerry's presidential dreams with SWIFT BOAT, has gone underground and is holding his new findings thisclose. "It's utterly devastating," reveals a source close to the publisher. "Obama may learn things he didn't even know about himself!" 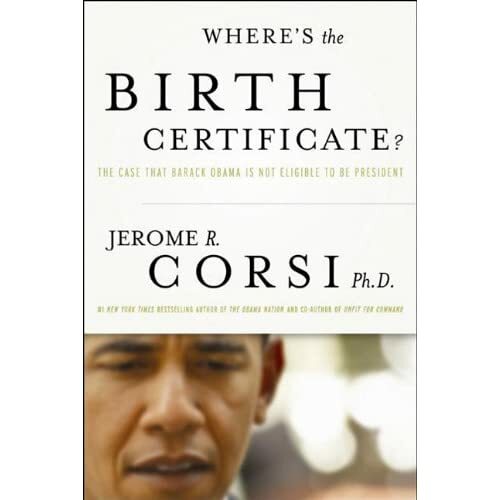 Does Corsi definitively declare the location of Obama's birth? Will the book finally -- once and for all -- put an end to the growing controversy? Or will it just ignite new ones!? "When Donald Trump said he sent PIs to Hawaii to get to the bottom of all this, he meant this book," declares an insider.